The world of dental implants is amazing technology. Teeth need each other for support. Missing teeth can cause alignments to shift. This can upset the bite and cause other problems to arise. Dental implants look a lot like a screw that is surgically implanted into the jawbone. The jaw heals around the implant making the situation a lot more stable than it would be with a missing tooth. The area of an extraction or lost tooth can cave in slightly if nothing is put in the place of it. This can cause the face to in fact cave in as well. The sunk in mid-face from missing teeth can age our appearance drastically. The implant will not only hold the space and support the surrounding teeth, a beautifully matching tooth will have you smiling with confidence. With the smile being so important missing or damaged teeth can make it hard to smile with confidence socially or other wise. When given the option of an implant versus dentures, an implant is the better choice. With dentures the bones will shrink away from the missing teeth. The jaw line and mid-face will sink in. Implants will help maintain the integrity of the bone structure in the face. The advantages of keeping a normal appearance with an implant is important. Implants are extremely durable as well. They can handle the force of chewing and grinding often as well as your own teeth. Dentures are great but they don’t hold up as well to the forces associated with the pressures of chewing and grinding. 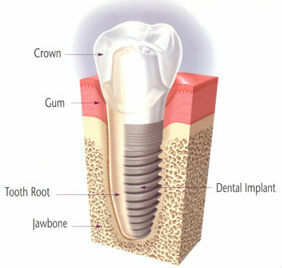 Silver State Dental offers the implant services you can depend on. Make an appointment with Dr. Young and let he and his staff answer all your questions and concerns with courtesy and respect. Come to an office that can handle all your dental needs in one beautiful facility. An implant can save the bite from shifting and causing all the past orthodontic work from moving. Save yourself from suffering with having to realign teeth due to nothing taking the place of a lost tooth. Have you had a dental implant elsewhere and need help with it? Silver State Dental can help with Implant Restorations. Moving away from the dentist who took care of the first procedure can be a nerve racking experience. Dr. Young will take care of your implant needs. If there is a problem with your implant it needs to be handled quickly. The team is ready to assist you with any dental concerns you may have. The Las Vegas office is a convenient solution to patients with implants. The practice is highly qualified in taking care of everything from your routine preventative visits to something as high tech as a new dental implant.